I have something called Toxic Injury (also known as Multiple Chemical Sensitivity, Environmental Illness, or Toxic-ant-Induced Loss of Tolerance). 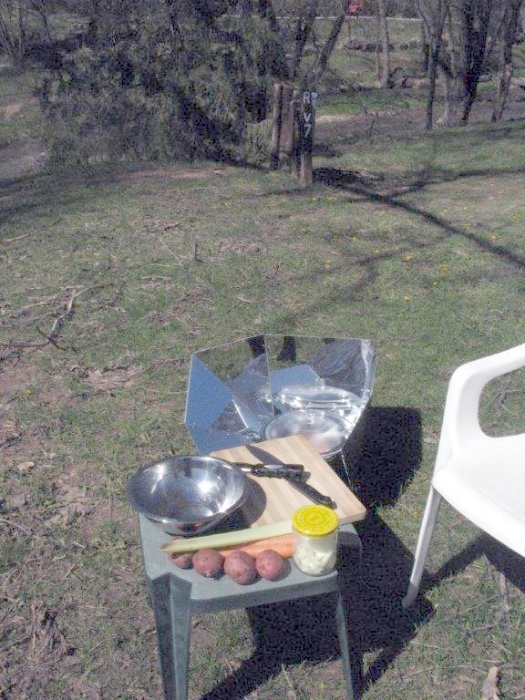 Propane (even if vented), natural gas, wood smoke, and charcoal all make me very ill, so this is initially why I was attracted to solar cooking. 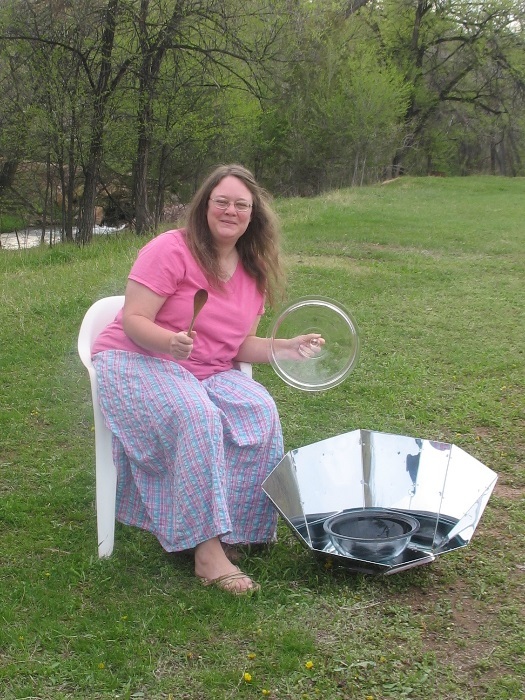 But I also love that solar cooking saves money, is great on the environment, and is a fun way to cook outside in the fresh air! I am so excited!! 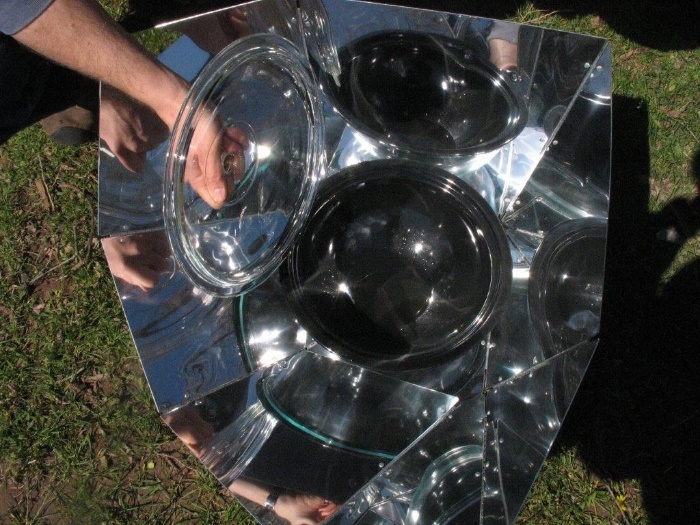 I got my new solar cooker this week—a Hot Pot!! So we read all the directions, washed the pot (with our nice, gentle Earth Friendly dish soap), and here we go! 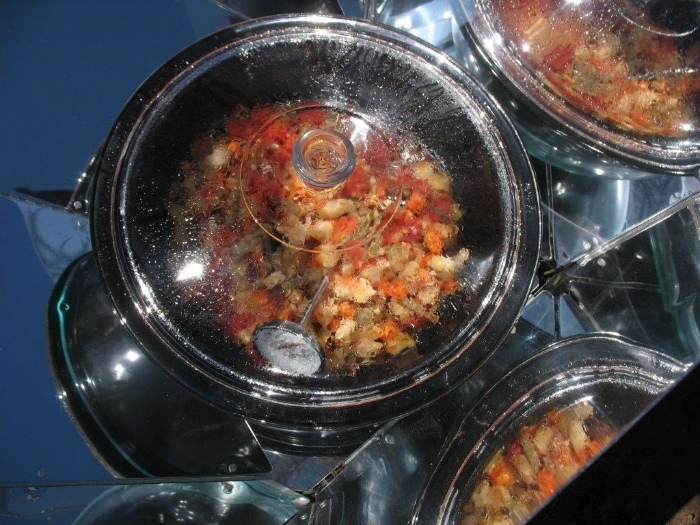 10 am— “swirl” of olive oil: oil into the pot, cover, set up facing the sun, set timer for 30 minutes. My very first sun-warmed food (hot oil) LOL It already smells good! 10:30 am—3/4 lb. 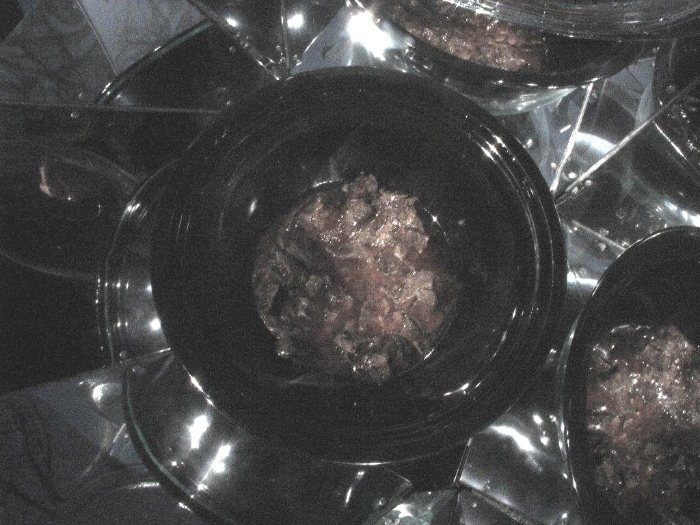 venison chunks: quickly add into pot & stir & cover; the meat sizzled when we added it—how cool is that! Set time for 30 minutes. Then prep: chop veggies fairly small, season veggies, open cans (this way all the ingredients are ready to dump quickly into pot and lose less heat that way). Meat after 30 minutes in pot—already browning! You can add any of your favorite stew ingredients or seasonings. Sometimes I like mushrooms and/or Italian seasonings in mine. 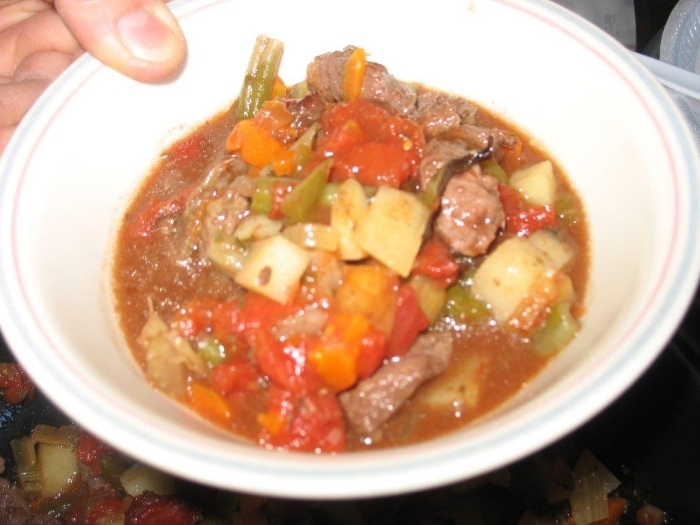 Often we change-up the seasonings to make it “stew but not the same.” This version (above), with the peppers, tomatoes, and paprika, has a bit of a Hungarian twist to it. (To further add to the Hungarian feel, after serving, stir sour cream into your bowl of hot stew—oh my and yum!) To try a Tex-Mex version, add black beans, corn, and chilies (leave out potatoes & green beans). In the mood for Indian? Try Indian spices (or ‘cheat’ and use curry) and cayenne (leave out potatoes), and serve over rice. My Mom taught me how to do this—easily change the flavors of ordinary recipes to suit your mood. I have to say, I’m out by a river, and it is pretty awesome to be cooking to the sound of rushing water and trilling red-winged blackbirds! I feel like a hearty mountain woman cooking out in the open! LOL Only no smoke is getting in my eyes or giving me asthma!!! 12:30 pm—quickly test temperature of food by inserting meat thermometer into the middle of the ‘pile’ of veggies/food. (This is to be sure of food safety—needs to be over 140 or 150 degrees Fahrenheit to stay safe for any time longer than 2 hours). It was 150 degrees F.! (Decided to leave meat thermometer in there, to watch temperature easier. Probably should have just put it in there to begin with! In another 15 minutes, it was up to 160 degrees F.) Adjust to sun. Set timer for 90 minutes. Always test for food safety—conditions can vary, depending on temperature of food when you put it in the pot, sun angle, etc. Food should either be below 40 degrees (refrigerator) or above 140 or 150 degrees. It should not be left at any temperature between these any longer than 2 hours. Therefore, when cold or room temperature food is put into the pot, it needs to come up to 140 or 150 degrees within a 2 hour time period, like mine did today. 5:00 pm—check temp (it was 170 degrees. By around 4 pm, we began to lose sun angle of course, but it presumably cooked a bit more as it began to cool down, and we like a 5:00 supper better than 4:00. Oh, my, how phenomenal that we cooked this for free!!! No fuel, no nasty propane combustion, no asthma-inducing (for me) smoke, not even any electricity. FANTASTIC! The veggies were cooked perfectly, and the meat was tender. There was some rich ‘broth’ in the bottom—this was my favorite part—I could have eaten a whole bowl of that! It took about 7 hours all together, with minimal work (basically checking temp & adjusting to sun) the last 6 hours. We are around 3,500 feet in altitude (ideal—the sun rays are less filtered). This was just enough to feed our family of five, although we needed a bit of dessert to fill up. But stews are often like that anyway. Stay tuned—More recipes coming soon down below!